A number of Coso petroglyph panels and elements (n = 10 panels; 190 individual elements) appear to portray many people dancing or traveling to or from a group ceremony (Figure 7). On one panel alone, in Renegade Canyon, there are over 80 individuals shown all in a row. The Numic Round Dance and Father Dance are associated with world renewal circle dances and songs (Spier, 1935; Steward, 1941:267, 1943b). Those dances served as thanksgiving to a supreme deity for the largesse that had come during the prior season. Such a group ceremony included reverent communication to a central immortal and hope for continuing bounty in the future. For the Southern Paiute (Numic) songs were a central element of the ceremony. These songs originated in the dreams of the attendees at the round dance and were sung to enhance the killing of game (Kelly and Fowler, 1986:383; McNeil, 2001; Patterson, 2001). Such large communal gatherings were associated with periodic abundance in resources facilitated in part by communal hunting of big game (Miller, 1983:77). A recurrent Coso motif (n = 200+ elements) details a figure (animal-human conflation) adorned with sheep’s horns (Figure 8). This suggests a ritual where a person would take on the spirit identity of the sheep. The idea of transformation from a human to animal is common to hunter art worldwide. Hunters are attuned to the qualities of animals and they become symbols for agility, survival, and power over one’s enemies. Increase rites and world renewal ceremonies regularly feature dancers in animal costumes, masks, and headdresses. The Numic also used hunting disguises. These included headdresses and body suits employing the entire skin and also using the head and horns (contra Keyser and Whitley, 2006; cf. Steward, 1943a:294; Stewart, 1942:242). (Figure 8) Sheep costumed figures. A variety of depictions of conflated human-animal figures. Full front facing bifurcated horns are a hallmark of the Coso style of bighorn depictions and are a feature common to all the figures. A and F have birdlike feet and hands. B, C, D, and E are more human in form with more human hands and feet. A is from Little Lake just outside and west of the Naval Air Weapons Station China Lake boundary. B is from Sheep Canyon. C is from Petroglyph Canyon. D, E, and F are from Renegade Canyon. If it were the Coso intention to magically control the habits of the sheep, ensuring success in the hunt, rendering such images would certainly be a sensible way of getting into the mindset of the bighorn. Miller (1983:79) and Olofson (1979:17) remark that it was the Numic practice to keep in contact with Spirit helpers through their minds, via telepathy, and that this process would routinely produce concrete expressions including personal health, success, and physical rewards. Hultkrantz (1986:633) indicates that spirits, sometimes in animal disguise, were some of the supernatural beings that were recruited by Numic individuals to provide them with success in hunting. Keyser and Whitley (2006:19, Figure 9a) seem to believe that a sheep horn headdress is impractical. They posit, because of the weight and configuration of sheep horns and crania, that such a disguise would not have been possible. However, ethnographic references document the head and horns as hunting disguises for the Great Basin Numic (Matheny et al., 1997:72; Steward, 1943a:294; Stewart, 1942:242). 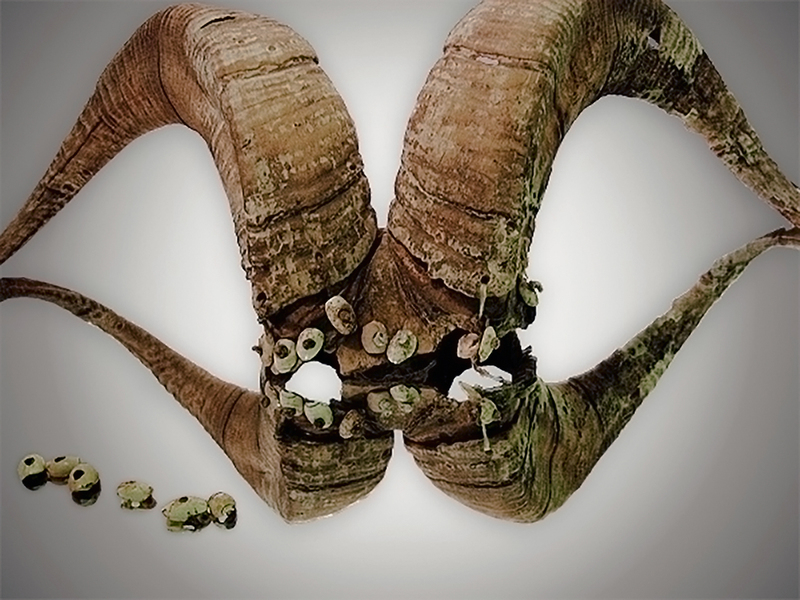 Also, in contrast to Keyser and Whitley, aboriginal ingenuity seems to have won out, with just such a bighorn crania and horn headdress being discovered in Canyonlands National Park in Utah (Matheny et al., 1997). The horns were divided in half to minimize their weight and were then sewn to the skull to ensure permanent attachment. Olivella shell ornaments were attached to this headdress and the regalia may have been used with a hood. Such a headdress could have served either as a ceremonial accouterment or as a more utilitarian hunting disguise (Matheny et al., 1997:73, Figure 2). Another analog to the sheep headdress was the bison (buffalo) headdresses of the Plains Indians. These were also heavy, awkward, and improbable but were nonetheless extensively employed and incorporated into animal pantomimes and ritual dances at seasonal increase ceremonies (Harrod, 2000). Murphey (1986:86) also has identified petroglyph elements strikingly similar to the horned anthropomorphs noted in the Coso Range. These petroglyph figures were identified at the Kanaka-Briggs Creek locality in the northern Great Basin in Idaho and were interpreted as similar in age to the peak production period posited for the Cosos or ca. AD 1000. Murphey argues that the horned anthropomorphic images depicted are hunters wearing mountain sheep disguises and/or ceremonial headdress paraphernalia.